Hitchcock Hall was the forerunner of the Cayuga Heights Elementary School. In 1956, because of financial challenges and changes in state regulations, the Union Free School District dissolved, and Hitchcock Hall became part of the Ithaca City School District (ICSD). The district renovated and added on to the structure in 1957. Sadly, the era of urban renewal brought about the demolition of Hitchcock Hall. ICSD replaced the building in 1969 with a modern structure, designed by the architectural firm of Levatich & Miller, that was subsequently enlarged. 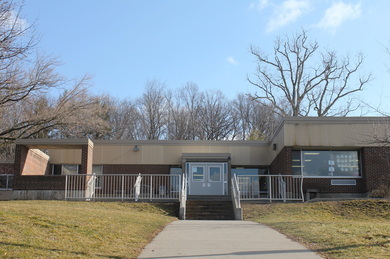 The modern Cayuga Heights Elementary School, shown in 2015, was designed by Levatich & Miller and completed in 1969. In 1980, enrollment decline caused the school district to close the elementary. Disappointed villagers responded with the formation of a Cayuga Heights Community Association under the leadership of Betty Matyas who lived next door. Tenants were found, including a Montessori school, to keep the building viable, and when enrollments climbed back up, the school was reopened in 1988 for both village children and those bussed from West Hill. ​In 1995, the large number of older adults who sold their homes and moved to Kendal at Ithaca flooded the real estate market with houses that young families proved eager to purchase, and so, once again the school was bursting at the seams. The CHES kindergarten playground, 2015 (photos by Patricia Longoria).